​The FIFA 19 Ultimate Team of the Week 23 came out Wednesday, and there are some players who have gotten some nice upgrades while others are getting their first In Form card of the season. Either way, these cards will certainly be some of the hottest commodities in Ultimate Team. Radja Nainggolan will certainly be happy, as the midfielder received his first In Form card of the season. The 30-year old Belgian scored his third goal of the season this week for Inter against Sampdoria, and has continued to be a mainstay in that midfield. Nianggolan also saw a +2 boost to his Shooting, Pace, and Passing. Mario Balotelli and Krzysztof Piatek also received In Form cards this week as they continue their outstanding play. Balotelli already scored his third goal for Marseille after being transferred from Nice at the end of January, and he has provided an offensive threat up top. As for Piatek, he continues his hot streak as he put two in the back of the net against Atalanta, giving him a total of four goals in his last three contests. Other notable players who are part of this Team of the Week are Marquinhos, Kingsley Coman, and Jan Oblak. 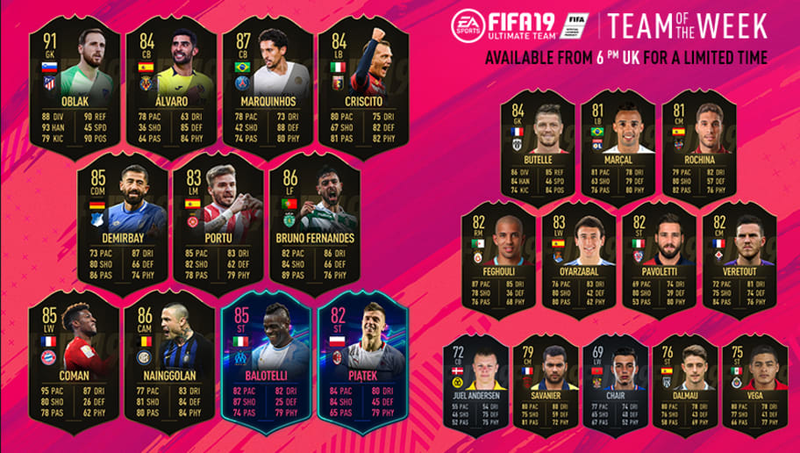 Some of these players may not fit into your Ultimate Teams because of the way you play or if chemistry doesn't work, but they could certainly help out with certain SBCs, so make sure you use them the best way you can!